I hope to post something good really soon. This morning I met with a customer at the local quilt store. She came up to me at my car in the parking lot. I usually meet customers inside, but hey, whatever, so I walked into the store with her. 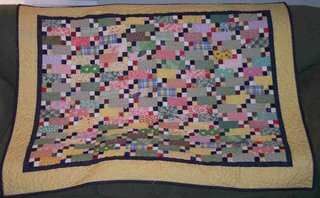 We sat our stuff down on a table and looked at her quilt and decided how it was to be quilted. 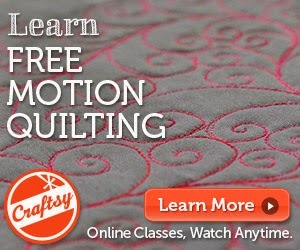 It's a really nice quilt and there's space to play with fun freehand quilting. We packed everything up and my customer left the store. I still had to purchase fabric for another customer. I paid for the fabric and gathered my stuff to go. 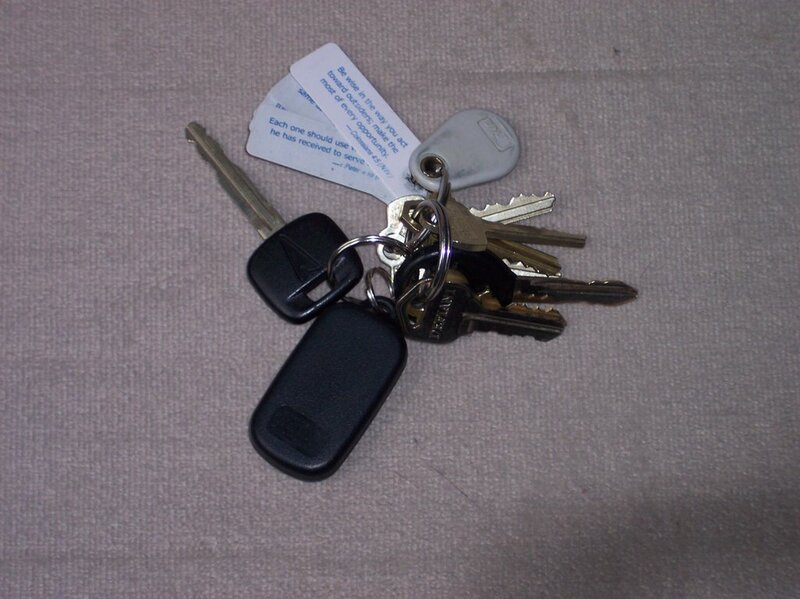 Wait a minute -- where are my keys? They were on the table next to my other stuff and now they are gone! I looked around a bit, but was quite sure that my customer took them with her by mistake. I called her house. Her husband offered her cell phone number and some parting advice 'You really should carry a spare key'. All right. Working to not be offended. So I called my customer's cell and left a voice mail. 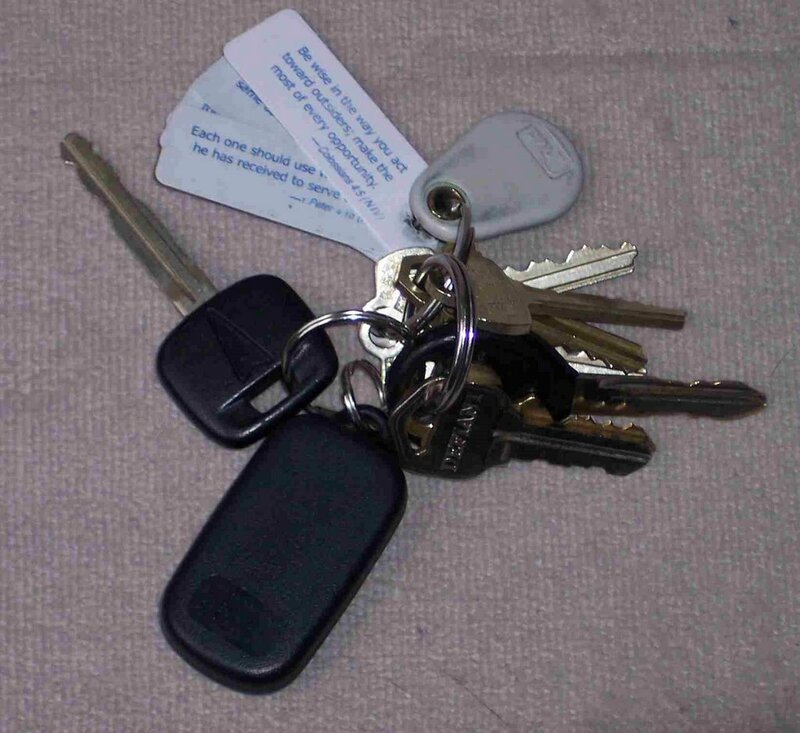 While I waited for a call back, I figured maybe I couldn't afford to spend 6-8 hours in a quilt store today (in both time and money), so I called my darling husband who plans to bring me his keys when he's out of his next meeting. Finally, my customer came back to the store to return my keys. She was sorry. I was grateful to have them back. Her parting advice? 'You really should carry a spare key'. 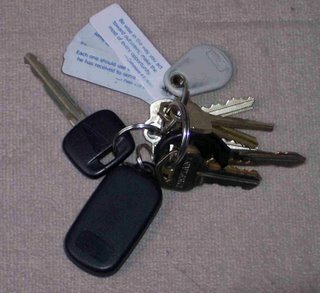 I once again gathered my stuff, this time including my keys. I went to my car and realized that I left my driver's door open this entire time. At this point, I decided that my other errands could wait. I simply needed to be safe at home. Hopefully this ended the annoying, but very funny, portion of my day. 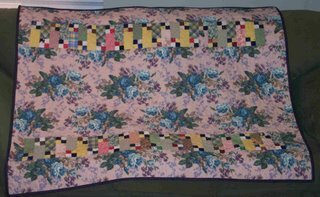 I've really enjoyed Bonnie's Quiltville site and started a few of her quilts (from stash, of course!) This is the first one that is finished. I made it smaller than hers. I had overflowing buckets of 1-1/2 inch strips and 2-1/2 x 4-1/2 inch blocks. 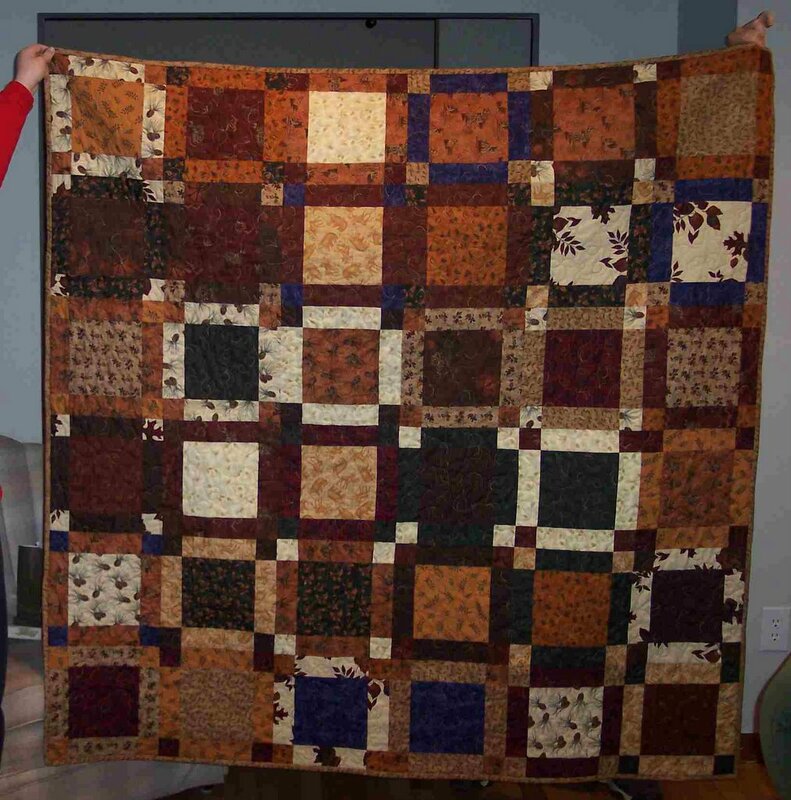 The whole quilt is only 46x58 (I tend to make large quilts, so this is TINY). I really love it, though. I wasn't sure if I'd like all the colors together, but they really worked. 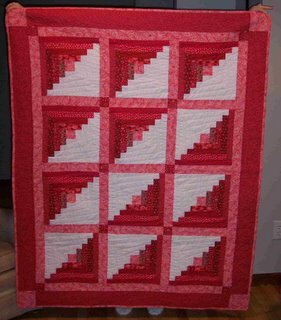 As for the quilting, this was a combination of 'get it done' and 'try something new'. 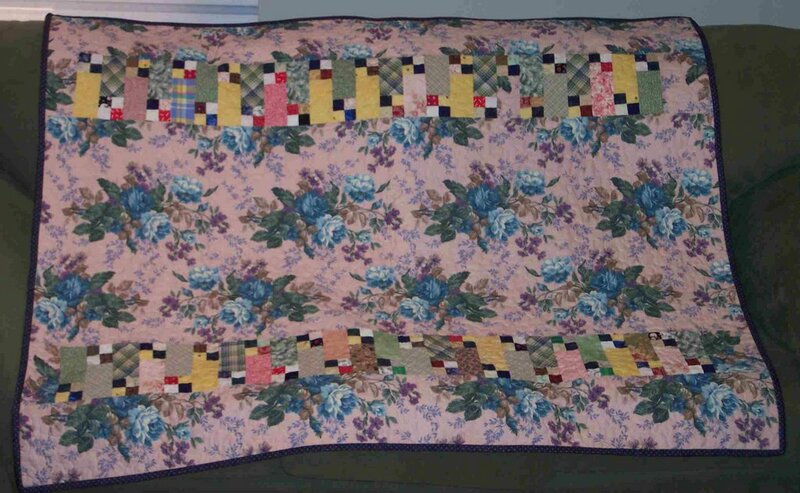 I quilted it with a simple meander but I used Alex Anderson's Masterpiece (sp?) thread on top and Bottom Line on the bobbin. The top thread broke a few times, but otherwise I was very happy with it. It deserves to be played with some more. 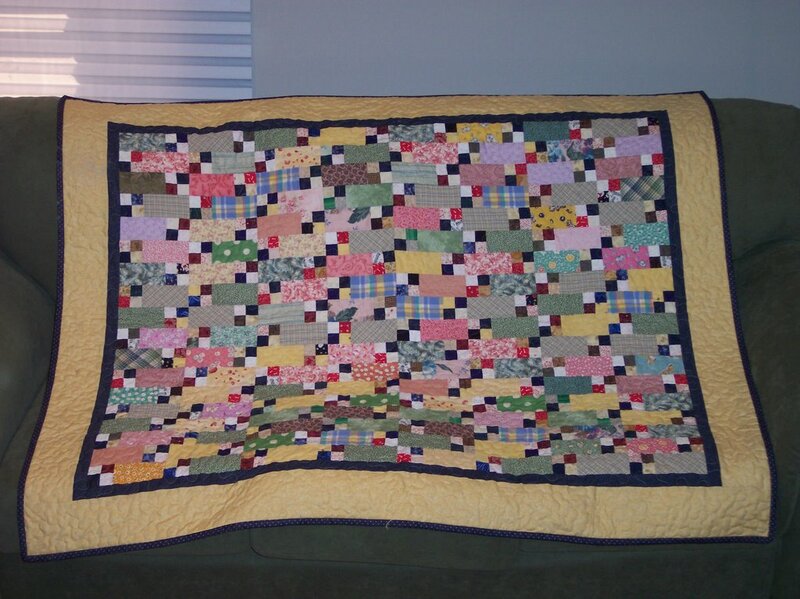 This quilt will go into the future gift pile. No one was home today, so I had to let the sofa hold up this quilt! 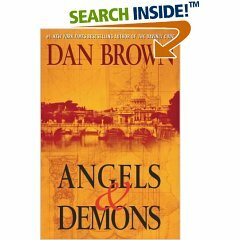 As for what I'm reading, I just finished Angels and Demons by Dan Brown. I've now read all of his books and would really like him to write faster. I liked Deception Point best of all of his books, but I am very much looking forward to seeing The DaVinci Code when it's released. I finished my therapy quilt!!! It was a lot of fun. I quilt other people's quilts as a job so when I quilt my own pieces I tend to do one of two things: I either quilt it quickly and simply just to get it done or I say 'why not?' and try something new. This quilt was a 'why not?' quilt. I tried Superior Bottom Line thread and some 'wonky' quilting (a new word I learned from the blog ring). The Bottom Line thread was nice, yet very, very fine. It worked great in the bobbin but didn't hold up well as a top thread. So, technically, HALF of this quilt is quilted with Bottom Line. I gave up part way through and used So Fine (also by Superior) as a replacement top thread. Superior says that Bottom Line is 'Designed by Libby Lehman for quilting, embroidery, bobbin, binding, and appliqué', but if it only works as a bobbin thread for me, then it's a bobbin thread. My guess is that it's a great hand applique thread, but I do so little of that. 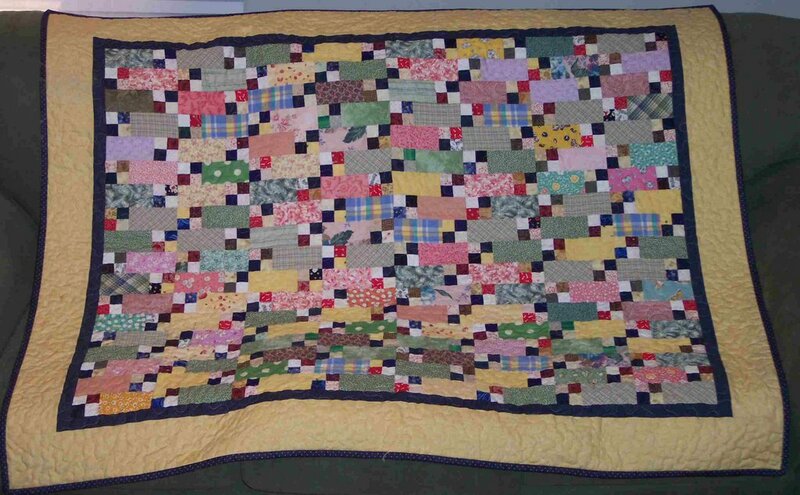 As for the 'wonky' quilting, I quilted diagonal lines in each of the logs and made a strange sort of spiral. Nothing new to other people, I'm sure, but something I've never tried myself. All in all, I love this quilt. I'm sure it'll be a gift at some point but I enjoyed having it around. It was truly great therapy. Please notice my darling daughter's fingers and socks as she is stretching to hold this quilt for me. Isn't she sweet? This next quilt is another Moda University quilt. I'm not 'wowed' by it but it's pleasant and best of all -- it's done. It'll be a gift at some point. This time, please notice my husband's handsome hand and my darling daughter's beautiful red cuff. Such a supportive family! I realized I never posted about my husband's event. It was wonderful. Truly. After the agony of shopping for a dress and shoes and a wrap and a bag... it was actually all worth it. My husband works for a very, very large company and he is a technology dude. That's most of what I know about how he spends 60+ hours a week. Anyway, he and his group worked on a technology product. They finished on time and on budget and the technology is selling very well. That is what this party was for. The company wanted to say thanks to the technology dudes and to their significant others for all their hard work and sacrifice. It was great to meet the people my husband works with as well as their spouses. The food was great. The music was great. The speakers were upbeat and brief. And there was actually a comedian who specializes in technology humor. Well done. Oh, about the clothes: they fit me well, fit the event well, and made me comfortable enough to speak to 'big bosses' when introduced. To sum up: I overthought the clothing and such, but it paid off in a very nice evening. Now, since I have this great dress, I am planning another great (smaller) event so I can wear the dress again. Convenient time for an anniversary, right?